Spire.XLS for WPF is a professional and powerful Excel component which enables developers/programmers to operate Excel files with their WPF applications. Spire.XLS for WPF allows developers to fast generate, edit Excel files. Developers can control Excel on cell formatting, page setup, data sort and filter, chart and formulas. Besides, developers can use this component to import data into Excel from database and export data from Excel to database. Without Microsoft Automation, Spire.XLS makes programming more simply. 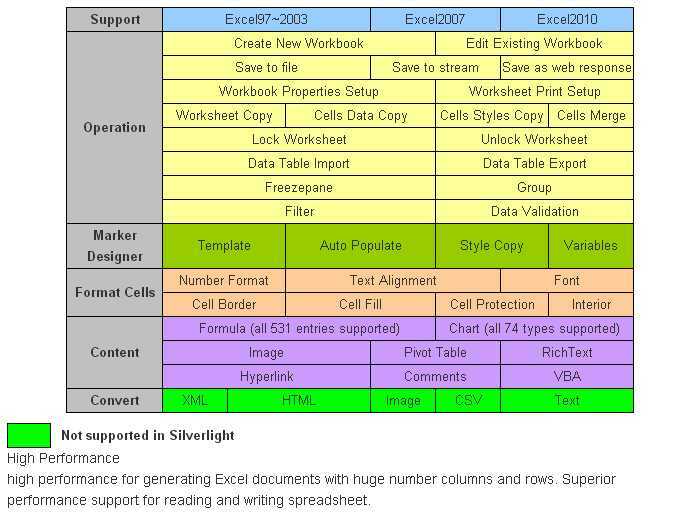 Spire.XLS for WPF supports to operate Excel 97-2003, Excel 2007 and Excel 2010. However, .NET Framework and Visual Studio must be installed for using Spire.XLS for WPF. Spire.XLS for WPF enables developers to protect Excel file by encrypting whole workbook or locking worksheet. It also enables developers to decrypt and unlock Excel. Spire.XLS for WPF enables developers to export data from database/datatable to a template Excel file, which has been well formatted.